When Land O’ Lakes resident Kass Pilczuk came to the New Tampa Family YMCA 11 years ago, she was a swim coach. Now she’s the adaptive coordinator, creating and maintaining programs for adults and youth with developmental or physical disabilities. It’s grown a lot over the years, especially considering where the program was when she first arrived. 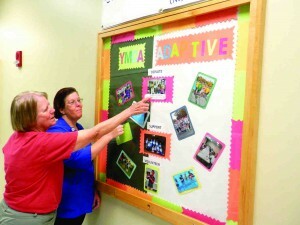 Kass Pilczuk, left, and her daughter Kathy look at the board commemorating the New Tampa Family YMCA’s adaptive program. When Pilczuk first came to the facility as a swim coach 11 years ago, the program didn’t exist. Now, she runs it. Today, the YMCA’s adaptive programs serve more than 40 people. The facility has adaptive programs in swimming, art, basketball and volleyball. It also has a group that participates in area walks and runs (they call them “rolls” if the participant is in a wheelchair). The main program is close to Pilczuk’s heart: Swimming. With both beginner and advanced classes, the swimming program has given people of all ages new confidence in the water. On May 3, the YMCA hosted its Fourth Annual Adaptive Swim Meet at its pool, 16221 Compton Drive. The meet included swimmers from an Orlando special-needs program and from the Hillsborough County Parks, Recreation and Conservation department. Pilczuk would like to get more YMCA facilities involved in future events. The swimming classes give the participants a lot more than lessons on good form, according to Pilczuk. “It’s something they can succeed at. They may not have the best technique, but they can have fun, and they can feel good about themselves,” she said. Pilczuk speaks from experience, and not just as the YMCA’s adaptive coordinator, or as a swim coach. Her daughter, Kathy, is developmentally delayed and has been swimming for decades. She participated in the adaptive meet, including making flip turns when she swam freestyle. Even though she’s one of the more advanced swimmers, Kathy enjoys being a part of the program. “You have fun and do all the different strokes,” she said. Some members become very skilled at those strokes. A couple of swimmers went on to swim for both the YMCA’s swim team and their high school’s team, Pilczuk said. That kind of acceptance is important, especially to individuals who don’t assimilate as often as they’d like in school. Most of the adaptive program swimmers don’t get that far, but they still reach milestones in the pool. 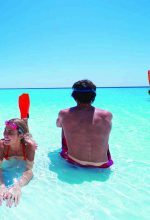 Many had never been swimming before, and Pilczuk recalls one participant who had never owned a bathing suit before joining. But they learn new skills, improve over time, socialize and support each other. The adaptive activities have helped hundreds of participants over the years, but increasing the size of the program is a constant challenge. Some families might have transportation issues, and the fact that participants must be facility members might discourage some from joining. That’s disappointing to Pilczuk, because the YMCA offers scholarships for those with financial hardships, and it has a reputation for not turning people away due to inability to pay, she said. The adaptive program is free with a YMCA membership. While swimming will always be important to Pilczuk (her son, Bill, was a five-time national champion and took gold at the 1998 World Championships), she also wants to keep building the adaptive program out of the water. A drama program would be a great addition, she said, but would depend on finding the right teacher. They’ve added a wellness program for adults, including participating in cardio and yoga classes, which is a separate activity a few days each month and is not included with YMCA membership. Pilczuk continues to work toward building a stronger, more diverse program. For more information about the adaptive programs at New Tampa Family YMCA, call Pilczuk at (813) 866-9622, or email gro.a1555953905cmyap1555953905mat@k1555953905uzcli1555953905pk1555953905.